Easily organize your desktop using Mosaico. Simply drag windows and they will automatically fit a predefined position. Save a desktop layout for each of your activities. All windows position and size are stored in a snapshot. Recall any saved layout with a single click. Save time and improve your productivity with Mosaico! Organize your desktop creating a custom layout for each activity: work, internet, gaming, files, etc. With Mosaico you can easily move windows and they will automatically fit a predefined position on screen. Capture their position and size on screen so that you can recall that layout later. Switch between layouts with a single click, or with your own keyboard combination. Mosaico is ideal when you work with many windows open. Just create your own layouts and stop searching for the “right” window in the taskbar. Download Mosaico for FREE and use it for 30 days with no limitation whatsoever! Organize your desktop by activities. Just tile windows and capture them in a snapshot. When you restore it, windows will be repositioned and applications will automatically run. It’s easy to set up your own layout. Just drag any window and a possible position will be displayed on screen. Drop the window and it will be automatically positioned. Mosaico is perfect if you have two or more monitors. You can easily move a window to another monitor and it will automatically adapt to the new desktop size. Mosaico automatically detects resolution changes. No more windows scattered everywhere after connecting a projector or after a new driver installation. 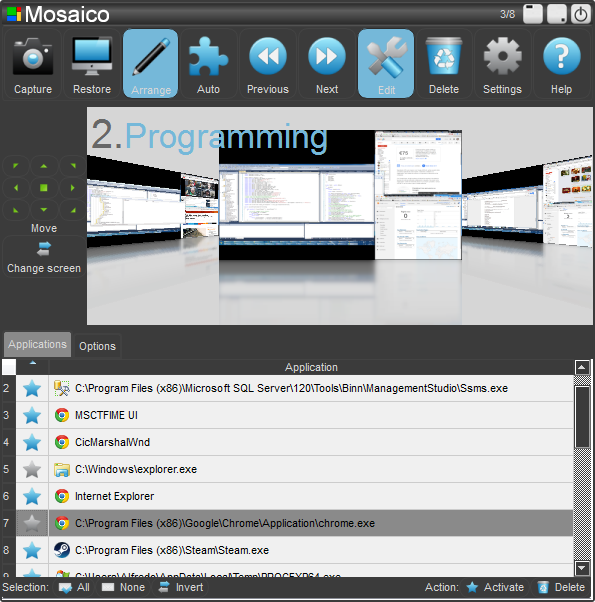 Mosaico doesn’t slow down your computer, uses very little memory and can be reduced to system tray to occupy zero screen space. It’s all about empowering your experience. You can customize snapshots, applications arguments, keyboard shortcuts, move commands etc. You can use Mosaico on different computers and keep the same experience. It’s easy to export and import your settings and snapshots. We know that GUIs are nice, but for everyday work keyboard shortcuts are essential. That’s why all the main commands are globally accessible via keyboard. Mosaico is designed to be easy to learn and easy to master. You can perform powerful actions just the way you are used to do the simple ones.